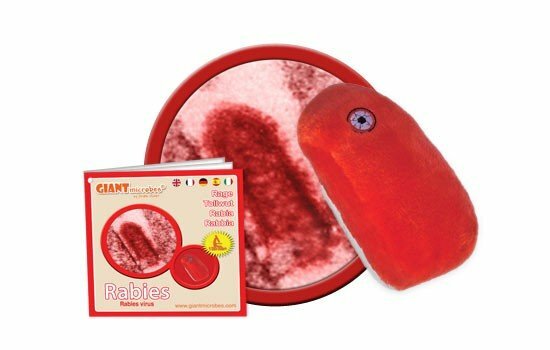 Rabies (Rabies Virus) under a microscope! FACTS: According to the famous song by Noel Coward, only mad dogs and Englishmen go out in the midday sun – but at least the dogs may have an excuse. In its latter stages, rabies causes fever, insomnia, hallucinations, foaming at the mouth, and extreme aggression. Rabies is present in the saliva of infected animals, and biting is the primary means of transmission, which is one reason mad dogs have been a source of terror since ancient times. (The other reason is their teeth.) After infection, it generally takes 3 to 12 weeks for the virus to spread through the nerves to the spinal cord up toward the brain. Once symptoms begin, death is inevitable. However, proper treatment during the incubation period can cure the disease, a discovery made by Louis Pasteur in 1885 when he used his newly developed vaccine to save a boy bitten by a rabid dog. 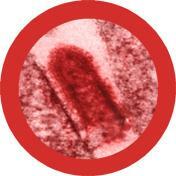 Since Pasteur’s discovery, the death rate from rabies has dropped 99%; 10 million people per year now receive post-exposure preventative treatment. While the treatment is painful and expensive, an abundance of caution is certainly justified after an animal bite, particularly where the animal is not available for testing. But why wait to be cautious? Ensure that your pets have the rabies vaccination and all appropriate booster shots; avoid contact with all wild animals and strays; and if an animal does bite you, clean the wound and call your doctor immediately. 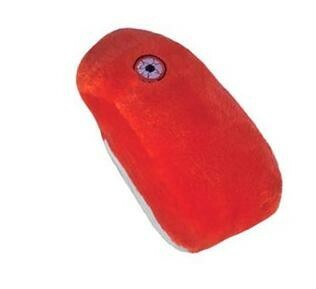 Copyright © 2014 Giantmicrobes, Inc. All Rights Reserved.